Klamath River Fishing looks to be on track for a pretty good salmon and steelhead season. The fish are milling around in the in the estuary and keep moving in and out with the tides. I have heard some reports of steelhead being caught in the lower section of the river, and a friend of mine told me today he has been seeing a few salmon each day. 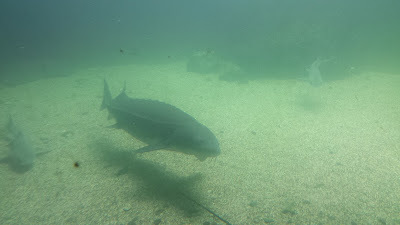 I was able to get some photos of a few sturgeon hanging out in the tribes holding tank at the mouth of the Klamath thought I might share with folks..